It’s Fair to say that Teddy Randazzo was on fire as a producer in 1965. Not only had he boosted Little Anthony & The Imperials back to the public consciousness in the past year, but he had launched a number of other careers. The Royalettes finally broke through to the pop charts, now onto producing works for Linda Carr, Timi Yuro and assorted others. One of the assorted others was The Impacts. 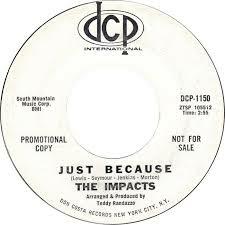 Their delightfully spun post-Doo Wop works were another canvas for Teddy to paint his interpretations of Symphonic Soul onto. Recycling the demure glimmer of his first records with Little Anthony & The Imperials, Randazzo uses a sparse arrangement glittering with small nuances that highlight the lyric and vocal performances here. One of his finest underrated works, it’s sad that neither this side nor “Pigtails” made an impact as Summer wound down into Fall of 1965.